Tired of cigarette butts littering the street? 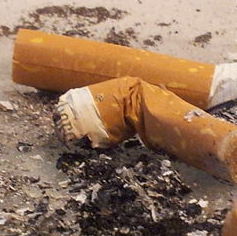 Cigarettes butts aren't just ugly to look at, as litter, they're also harmful to the environment. Cigarette filters are not biodegradable, they're plastic, and full of toxic chemicals that are harmful to our waterways, our soil and our wildlife. Product packaging is a big problem, and it's growing! What else can we do to cut down on packaging and get it out of our garbage? TEA created a report in 2011 to explain why companies need to be part of the solution to reducing packaging and product waste in Ontario.